Additional ports available on back. 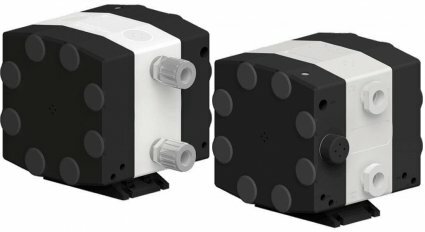 PSB Series diaphragm pumps feature Teflon® PTFE and PFA fluid paths for high-purity chemical delivery, dispense and transfer applications. It is capable of 95 lpm (25 gpm) flow rates and 5.5. Bar (80 psi) air supply pressures. PSB100 pumps are direct retrofit replacements for obsolete chemical delivery pumps. *Graph is for reference only. Performance was measured utilizing 1/2 in (3/8 in ID) air line and 1-1/4 in (1-1/8 in ID) liquid lines with 1 ft flooded suction. Performance may vary in your system. Chart represents flow at 5,000 ft, adjusted to sea level. CPC, CPT, or custom. Contact White Knight. *May vary depending on configuration. Suction lift diminishes over time. Recommended installation level less than 3 ft above source. Contact White Knight for details.